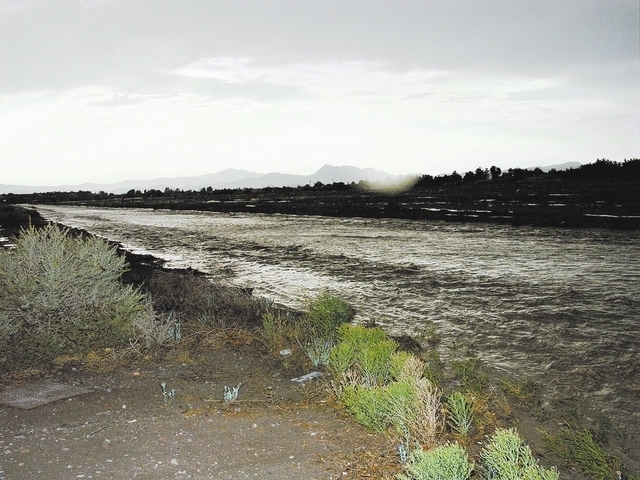 TONOPAH — A proposal by Mountain Falls representatives to reimburse the county $93,000 for digging two flood channels was hailed by county officials Tuesday as a first step to avoid future flooding, like after major rainfall last summer. Mountain Falls selected Patriot Contractors LLC as the lowest of several bidders to dig channels within public rights of way on the north side of Gamebird Road, from Highway 160 to Malibou Avenue and along Yucca Springs Road, a block south of Gamebird Road. Commissioners approved a memorandum of understanding with William Lyon Homes Inc., developer of the Mountain Falls subdivision. The MOU states the modifications to flood zone designations proposed by the Federal Emergency Management Administration (FEMA) would adversely affect properties at Mountain Falls. The flood channels were first proposed as part of a flood control study presented by Bureau Veritas in 2007 and accepted by county commissioners but never implemented. If the cost exceeds $100,000, William Lyon Homes will reimburse the county for the overage. Commissioner Butch Borasky wanted to postpone action approving the work until he got more information, but later endorsed the project. He said it was an area heavily impacted by monsoon storms in July. Commissioner Frank Carbone asked if the county needs anything else from Mountain Falls to ensure water will be diverted in those areas. Fanning said he hasn’t seen any of those assurances. “You’d be thinking of the Yucca Springs Channel where it then dumps back into their property and making sure they retain that water for their time period. I have not seen anything,” Fanning said. County Manager Pam Webster said some of the flood improvements would be addressed in a development agreement when William Lyon Homes decides to develop that property, which is currently vacant, sitting just north of the subdivision and golf course. Borasky said the Gamebird Road channel will be cut 60 feet wide at the top, tapering off to 30 feet wide at the bottom. Borasky inquired whether the channel on Gamebird Road would prevent flooding on Homestead Road. Fanning said future plans are to address master plan drainage as far as Homestead Road. Fanning told Borasky the county didn’t have the funds to maintain the channels but said it would be a great start to a flood channel, which would be 100 percent successful if it was dug continuing west past Homestead Road. Scott Eldon Swapp, an engineer for William Lyon Homes, said the channels will alleviate problems along Gamebird Road. He described it as an interim measure typical of flood control projects in Las Vegas. Fanning said it would be like the drainage improvements on Blue Diamond Road near Fort Apache Road going into Las Vegas. “It takes the master plan that Nye County has to another level that we didn’t expect to happen yet,” Swapp said. Bureau Veritas presented a master flood control plan to county commissioners in 2007 that would cost homeowners $180 per acre but possibly save flood insurance costs. The firm was paid a $386,986 contract. It would consist of nine dams on Wheeler Wash at a cost of $40 million, which has a 93-square-mile catchment basin. It included a series of channels to 18 detention basins on the west side of Pahrump Valley that would cost another $75.6 million. District Attorney Brian Kunzi said he looked at potential liability issues. He said the only area that could get more water from the channels would be agricultural land, everything else would show improvements. Swapp said FEMA has been extremely receptive to their proposal. Fanning said there are meetings scheduled with the town of Pahrump about routing overflows going onto the fairgrounds property where they need water. “We have to start somewhere. We have a developer willing to give us $100,000 to start work. This is my district, I have been approached by citizens out there to do something,” Schinhofen said.